NEW COURSE HOURS for our 55 hour “Introduction to Audio Engineering Program”. Begins November 19th, Mondays and Wednesdays from from 10:00am – 2:00pm or 6:30pm – 10:30pm. Outline: Choose either “55 hours – Introduction to Audio Engineering” or “100 hours – Advanced Audio Engineering”. These programs are comprehensive using state of the art equipment and studios. Students attend lecture classes in the studio and then learn “hands on” in small groups with the instructor in the control room. The programs focus on recording studio audio engineering and studio techniques. Program enrollment in the 100 hour program includes a new hardware interface and Pro Tools recording software that easily installs on many computers; the 7th edition David Miles Huber “Recording Studio Handbook”; a question and answer workbook, and a “Pro Tools Official Courseware Manual”. These are SCHEV (State Council for Higher Education in Virginia) approved programs, authorized to award “Certificates of Completion” to the graduated student. – (48) hours of comprehensive lecture and instruction with the engineer/instructor in both Cue’s control rooms and studios. Included in this time is the recording and mixing of a “real recording artist”, where the student participates in the sessions to both learn and implement these professional phases of audio recording and mixing. – (7) hours of Studio Lab time where the student practices and hones his or her new audio engineering skills in a real recording studio. Assignments are given along with general experimentation of various audio processing, recording and mixing software where the student commands the helm of the “recording engineer’s seat”. The building of confidence and fluency of their new knowledge of engineering in the control room is achieved most effectively through repetitive implementation of these skills. Additionally we facilitate discussions pertaining to industry related “job and career” requirements, peripheral knowledge and skills that accentuate the applicants credentials, and a mock-up job interview with the school’s director or course administrator. Upon successful completion of the 55 hour program, Cue Studios’ Center for Audio Engineering awards a “Certificate of Completion” to the graduated student. After the course the student is encouraged to schedule an internship at Cue where he or she will observe and render tasks, participate in real recording sessions, and gain first hand knowledge of the inner workings of a successful recording studio business. If you’re serious about your audio education, call our course administrator at 703 532 9033 to schedule a meeting with an instructor. You’ll meet in the studio/classroom and observe first-hand the environment and equipment used in your program. If you would like to enroll in this program, click here for our online shopping cart. – (75) hours of comprehensive lecture instruction with the engineer/instructor in both Cue’s control rooms and studios. Included in this time is the recording and mixing of a “real recording artist”, where the student participates in the sessions to both learn and implement these critical phases of audio production. – (25) hours of Studio Lab time where the student practices and hones his or her new audio engineering skills in a real recording studio. 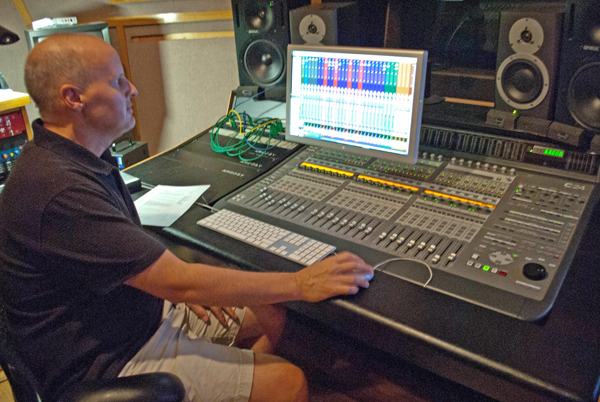 Assignments are given along with general experimentation of various audio processing, recording and mixing software use where the student commands the helm of the “recording engineer’s seat”. The building of confidence and fluency of their new knowledge of engineering in the control room is achieved most effectively through repetitive implementation of these skills. – Included with the 100 hour program is a hardware interface and Avid Pro Tools recording software. Both easily installed on most computers. Upon successful completion of the 100 hour program, Cue Studios’ Center for Audio Engineering awards a “Certificate of Completion” to the graduated student. All of our private programs have similar course descriptions, though differ in their respective degrees and intensity of audio engineering theory and application. This 100 hour option is our most sought after program where the student works privately with the instructor and focuses on various areas of audio engineering. During discussions and an interview with the student, we custom tailor a program that addresses their individual desires, taking into account their current level of audio engineering skills and education, in preparation for entry into the professional audio industry or running their own studio. Program enrollment includes Avid Pro Tools software and an Avid recording system interface, with the 7th edition David Miles Huber “Recording Studio Handbook” and a “Pro Tools Official Courseware Manual”. – (75) hours of intensive “one on one” instruction with the engineer/instructor in both Cue’s control rooms and studios. Included in this time is the recording and mixing of a “real recording artist”. – (20) hours of Learning Lab time where the student practices and hones his or her new audio engineering skills. Assignments are given along with general experimentation of various audio processing, recording and mixing software. – (5) hours of unassisted “mixdown” time in Studio “A” or “B” where the student is in the “driver’s seat”. Building confidence and fluency with their command of engineering in the control room is achieved most effectively through repetitive implementation of their new skills. Additionally we facilitate discussions pertaining to industry related “job and career” requirements, peripheral knowledge and skills that accentuate the applicants credentials, and a mock-up job interview with the school’s director and studio owner, Jeff Jeffrey. During and after the course, the student is encouraged to participate in Cue’s internship program to observe and render tasks while gaining first hand knowledge of the inner workings of a successful recording studio business. Recording Seminar: Held in Cue’s Studio “A”, on October 13th, Saturday, from 10:00 am – 3:00 pm with a midway break. This (5) hour course taught by Jim Ebert (a multi-platinum awarded engineer) occurs in a limited class setting. Learn about studio techniques, recording concepts, and equipment types – including microphones, mic pre’s, compressors, studio monitors, analog and digital recording systems, and mastering. This recording overview is designed for beginning engineers and home studio enthusiasts interested in furthering their knowledge of modern recording equipment and techniques. There will be a short break midway between the five hour course. Please bring a note pad and pen, and a print-out of your paypal receipt or email confirmation or your enrollment. From selecting the right microphones to getting pro sounds in the control room, we’ll cover the basic “chain” of audio signal development and processing from start to finish. Monitors: Knowing what you hear. Studio monitors, car speakers, reference CDs and other criteria for a proper listening environment. Includes recording, editing, comping, looping, tuning, quantizing and mixing. Question and answer period at the end of the course. **Reserve your space now as class size is limited. Just call Cue’s studio manager Dusty at 703 532 9033. Most major credit cards accepted. The course explains everything you need to know to do your own recordings ranging from what type of mic to use and where to put it, to editing/mixing/mastering techniques within Pro Tools. Whether you know a little or a lot, I guarantee you will learn something new, and have fun too. Jim and Sean were very informative and had answers to all of my questions. I highly recommend this course to anyone interested in audio engineering…. Paul O. past attendee. Our most diversified educational option, which provides an excellent audio engineering course coupled with a music producing course. This curriculum is designed for those seeking a position or career in either field, thus providing a broader and more complete recording industry education. 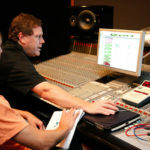 The first part of the program delivers a comprehensive audio engineering education, with the student primarily working “one on one” with the instructor. 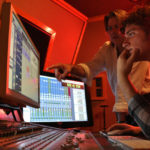 During discussions and an interview with the student, we custom tailor a program which includes theory and extensive “hands on” training addressing their individual goals, taking into account their current level of audio engineering skills and education, in preparation for entry into the professional audio industry or running their own studio. Program enrollment includes Avid Pro Tools software and an Avid recording system interface, with the 7th edition David Miles Huber “Recording Studio Handbook” and a “Pro Tools Official Courseware Manual”. And many other facets of being a real producer that serious recording artists and engineers frequently need. The student will learn from A multi-platinum awarded engineer/producer/instructor. Additionally, we facilitate discussions pertaining to industry related “job and career” requirements, peripheral knowledge and skills that accentuate the applicants credentials, and a mock-up job interview with the school’s director and studio owner, Jeff Jeffrey. Upon successful completion of the 180 hour program, Cue Studios’ Center for Audio Engineering awards a “Certificate of Completion” to the passing student. 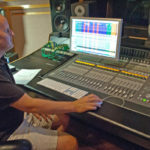 For anyone who has ever wanted to learn to record music, or just want to know how recordings are made, Cue Recording Studios in downtown Falls Church has a school that offers classes in audio engineering and music production. Cue Recording Studios opened 30 years ago and has been at its current Falls Church location for 25 years. During this time, they’ve worked with artists and personalities ranging from Michael Jackson to Archbishop Emeritus Desmond Tutu. They began offering classes 10 years ago as the Cue Studios Center for Audio Engineering. The State Council of Higher Education for Virginia (SCHEV) certified school has four instructors: Jim Ebert, Ken Schubert, John Krauss and Blaine Misner. All are trained audio engineers, and Ebert is a music producer. The school focuses on two areas: audio engineering and music production. 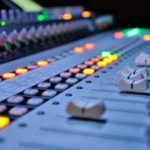 Audio engineering teaches the nuts and bolts of recording in terms of microphone placement and how to use the instruments and equipment to achieve the desired sound. 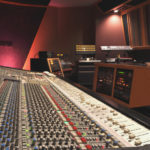 Music production involves working with the artist to record the song by recruiting the right people to help out, working with the music and song itself, and post-production mixing. There are a variety of courses offered with a range of depth and intensity, from a five-hour course to a 100-hour course. Some courses offer a state certificate of completion at the end, which allows students to use this degree when job hunting. All the classes are less than $10,000, and most under $5,000, making them less expensive than a four-year program for audio engineering. In addition to the certificate-seeking students, there are also students with no previous knowledge of the audio world and no intention of pursuing it as a career. Ebert offers a five-hour introductory class once a month where he teaches a brief overview of the production process, from setting up microphones to working with artists. “It’s not just for musicians or aspiring audiophiles, a lot of people who come into that class are just people who are like ‘how does this happen, how does music happen when it’s recorded,” Ebert said. The instructors place an emphasis on hands-on learning, which students in larger programs often do not receive. Both one-person classes and small group classes are offered, with an emphasis on one-on-one learning. “With the one-on-one courses, we can really cater to that person. If they come to me and say ‘I really want to learn to work with artists,’ or ‘I’d really like to mix,’ I can tailor the course to what they want,” Ebert said. 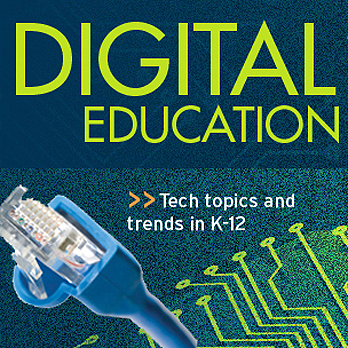 Although they focus on hands-on learning, students still receive the required basic technical background and most of the courses use a textbook. For those who are looking for a career, the audio industry is rapidly expanding and in demand. Although recording albums may be the first thing that comes to mind, there is a diverse range of uses for Pro Audio, the software program Cue Recording Studios and many others use, including music for video games, narration recordings, and audio post-production for film and television. The Center for Audio Engineering can teach the skills required for all fields of audio production. Even with all the offered classes, Cue Recording Studios remains a fully functioning recording studio. It has 10 gold and platinum awards and is a member of the National Academy of Recording Arts and Sciences (NARAS) and the Society of Professional Audio Recording Services (SPARS). Students have the opportunity to work with artists using the studios as they take their classes and watch other professionals at work. “When you come here, it’s cool as a student because you get to hang out with platinum-winning producers, engineers, artists, and up-and-coming local talent who are cutting their new records while you’re here learning,” Jeffrey said. These experts create a strong support system for students. “We encourage all of our students to come up and spend time either interning or coming through and talking to the different staffers here and asking the questions that they may not have had the opportunity to ask in class,” said Jeffrey. The Cue staff is happy to talk to anyone interested in attending the Center for Audio Engineering. “We encourage all of our potential students to come in and have a free meeting with Jim or one of our other instructors,” Jeffrey said. More information about the Cue Studios Center for Audio Engineering can be found on its website, centerforaudioengineering.com, or by calling the office at 703-532-9033. The studios are located at 109 Park Ave., Falls Church. All of our private programs have similar course descriptions though differ in their respective degrees and intensity of audio engineering theory and application. This 30 hour option is our entry level program where the student works privately with the instructor and focuses on various areas of audio engineering. During discussions and an interview with the student, we custom tailor a program that addresses their individual desires, taking into account their current level of audio engineering skills and education, in preparation for entry into the professional audio industry or running their own studio. Program enrollment includes the 7th edition David Miles Huber “Recording Studio Handbook” and a “Pro Tools Official Courseware Manual”. – (20) hours of intensive “one on one” instruction with the engineer/instructor in both Cue’s control rooms and studios. – (5) hours of Learning Lab time where the student practices and hones his or her new audio engineering skills. Assignments are given along with general experimentation of various audio processing, recording and mixing software. – (5) hours of solo “mixdown” time where you are at the console in a professional studio commanding the equipment. Upon successful completion of the 30 hour program, Cue Studios’ Center for Audio Engineering awards a “Certificate of Completion” to the graduated student. Taught by Gold & Platinum awarded producer Jim Ebert (clients include Butch Walker / Marvelous 3, SR-71, Toni Braxton, Honor By August, Madonna, HR of The Bad Brains, and hundreds of other national and local artists) in Cue’s legendary studios. Learn production skills and techniques from a real pro, record and produce a real band, and experience first hand how to “produce” great recordings during (65) hours in the studio and control room recording and then mixing the band you recorded. During and at the end of the program the student will use (15) hours of Lab Time practicing their Pro Tools and computer skills. Cost is $7,750 for our “One on One” private course OR $3,750 for a Group Class course. You’ll learn effectively with extensive “Hands-On” training using instruments, amps, recording software, and state-of-the-art recording gear while you produce the area’s finest studio musicians performing as a session band. Call Dusty at 703/532-9033 for more info. Course options are days, nights and weekends. Call for current group class dates, or to schedule convenient “one on one” dates. From mastering world class audio gear to understanding “the song” and “the artist”, this program is essential for anyone interested in becoming a professional music producer, or just taking their music career to the next level. Watch the below course video for a course demonstration. Learn various types of production techniques used in alternative, rock, crossover country and many other musical styles. Upon successful completion of the (80) hour program, Cue Studios’ Center for Audio Engineering awards a “Certificate of Completion” to the graduated student. If you’re serious about your audio education, call our course administrator at 703 532 9033 to schedule a meeting with Jim. You’ll meet in the studio and observe first-hand the environment and equipment used in your program. Click the below links to sign up for either course using our online Paypal or credit card payment option, or contact our business office at 703 532 9033 to pay in person or by telephone. Group Classes adhere primarily to the below syllabus, and “One on One” private classes can be tailored to specific needs in accordance with individual strengths and weaknesses of the student. 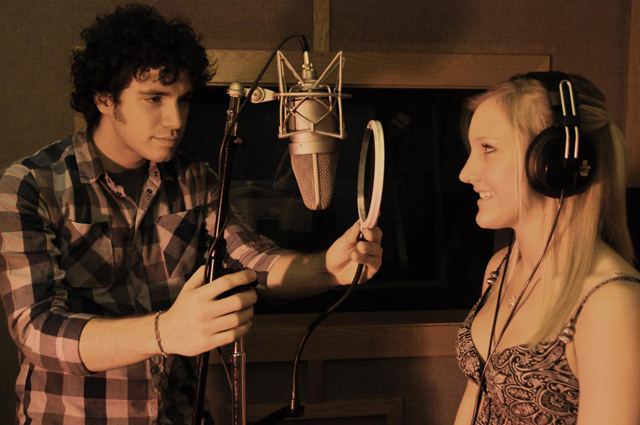 • Choosing Microphones for your Artist. • Setting up an Environment for your Artist Sonically and physically. • Making sure you understand the Lyrics and meaning of the song and your input into the performance. • Learning the rules then breaking them. This 55 hour option is our mid-level program length where the student works privately with the instructor and focuses on various areas of audio engineering. During discussions and an interview with the student, we custom tailor a program that addresses their individual desires, taking into account their current level of audio engineering skills and education, in preparation for entry into the professional audio industry or running their own studio. Program enrollment includes Avid Pro Tools software and an Avid recording system interface, the 7th edition David Miles Huber “Recording Studio Handbook” and a “Pro Tools Official Courseware Manual”. 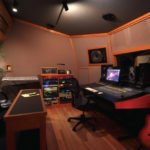 – (45) hours of intensive “one on one” instruction with the engineer/instructor in both Cue’s control rooms and studios. Included in this time is the recording and mixing of a “real recording artist”. A new study from Purdue University has shed some light on how to most effectively engage students in technology and engineering at a young age. Research shows that students have “a deeper understanding” of concepts learned in a hands-on environment than what can be digested through more traditional lecture-based lessons. This is especially true in students for whom English is not the first language. 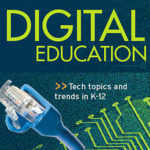 Check out this and more in a very interesting article at Education Week. All of our audio engineering programs have similar course descriptions, though differ in their relative degrees and intensity of theory and application. This 55 hour option is our entry level program where the students work in small groups with the instructor and focus on various areas of audio engineering. Program enrollment includes Avid Pro Tools software and an Avid recording system interface, the 7th edition David Miles Huber “Recording Studio Handbook” and a “Pro Tools Official Courseware Manual”. – (5) hours of unassisted “mixdown” time in Studio “A”, “B” or The Red Room where the student commands the helm of the “driver’s seat”. Building confidence and fluency with their knowledge of engineering in the control room is achieved most effectively through repetitive implementation of their new skills. After the course, the student is encouraged to schedule an internship at Cue where he or she will observe and render tasks, while gaining first hand knowledge of the inner workings of a successful recording studio business. If you’re serious about your audio education, call our course adminstrator at 703 532 9033 to schedule a meeting with an instructor. You’ll meet in the studio/classroom and observe first-hand the environment and equipment used in your program.